The Berlin State Opera (German: Staatsoper Unter den Linden) is a German opera company. Its permanent home is the opera house on the Unter den Linden boulevard in the Mitte district of Berlin, which also hosts the Staatskapelle Berlin orchestra. Originally the Hofoper (court opera) from 1742, it was named Königliches Opernhaus (Royal Opera House) in 1844, and Staatsoper unter den Linden in 1918. It is also known as Deutsche Staatsoper, and short as Lindenoper. From 1949 to 1990 it was the state opera of East Germany. Since 2004, the Berlin State Opera belongs to the Berlin Opera Foundation, like the Deutsche Oper Berlin, the Komische Oper Berlin, the Berlin State Ballet, and the Bühnenservice Berlin (Stage and Costume Design). King Frederick II of Prussia shortly after his accession to the throne commissioned the original building on the site. Construction work began in July 1741 with what was designed by Georg Wenzeslaus von Knobelsdorff to be the first part of a "Forum Fredericianum" on present-day Bebelplatz. Although not entirely completed, the Court Opera (Hofoper) was inaugurated with a performance of Carl Heinrich Graun's Cesare e Cleopatra on December 7, 1742. This event marked the beginning of the successful, 250-year co-operation between the Staatsoper and the Staatskapelle Berlin, the state orchestra, whose roots trace back to the 16th century. In 1821, the Berlin Opera—hosted at the Schauspielhaus Berlin—gave the premiere of Weber's Der Freischütz. In 1842, Wilhelm Taubert instituted the tradition of regular symphonic concerts. In the same year, Giacomo Meyerbeer succeeded Gaspare Spontini as General Music Director. Felix Mendelssohn also conducted symphonic concerts for a year. On August 18, 1843 the Linden Opera was destroyed by fire. The reconstruction of the building was supervised by architect Carl Ferdinand Langhans, and the Königliches Opernhaus (Royal Opera House) was inaugurated the following autumn by a performance of Meyerbeer's Ein Feldlager in Schlesien. In 1849, Otto Nicolai's Die lustigen Weiber von Windsor was premiered at the Royal Opera House, conducted by the composer himself. At the end of the 19th century and the beginning of the 20th century, the Royal Court Opera, Berlin, attracted many illustrious conductors. They included Felix von Weingartner, Karl Muck, Richard Strauss, and Leo Blech. After the collapse of the German Empire in 1918, the Opera was renamed Staatsoper unter den Linden and the Königliche Kapelle became Kapelle der Staatsoper. In the 1920s, Kurt Adler, Wilhelm Furtwängler, Erich Kleiber, Otto Klemperer, Alexander von Zemlinsky, Bruno Walter occupied the conductor's post. In 1925, Alban Berg's Wozzeck, was given its premiere in a production conducted by Erich Kleiber in the composer's presence. After having undergone an extensive renovation, the Linden Opera reopened on 28 April 1928 with a new production of Die Zauberflöte. The cast included Delia Reinhardt, Richard Tauber, Friedrich Schorr and Leo Schützendorf, conducted by Erich Kleiber. In the same year, the famous Russian bass Feodor Chaliapin and Serge Diaghilev's Ballets Russes with conductor Ernest Ansermet were guest performers. In 1930 Erich Kleiber conducted the premiere of Darius Milhaud's Christophe Colomb. However, in 1934, when symphonic pieces from Alban Berg's Lulu were performed by Kleiber, the National Socialists provoked a scandal and the conductor was forced into exile. After Hitler's Nazi takeover, members of Jewish origin were dismissed from the ensemble. Many German musicians associated with the opera went into exile, including the conductors Kurt Adler, Otto Klemperer and Fritz Busch. Clemens Krauss became a prominent German conductor first at the Berlin State Opera in 1933 and was then appointed as its director in 1935 due to Fritz Busch and Erich Kleiber resigning, respectively, their positions in protest over Nazi rule. During the Third Reich, Robert Heger, Herbert von Karajan (1939–1945) and Johannes Schüler were the "Staatskapellmeister". 1938: Werner Egk conducted the first night of his opera Peer Gynt on November 24. Herbert von Karajan´s interpretation of Mozart´s Die Zauberflöte was performed on December 18. Karajan continued as Generalmusikdirektor, the principal musical director of the Staatsoper Unter den Linden between 1941 and 1945. 1939: Karajan conducted a performance of Rudolf Wagner-Régeny's Die Bürger von Calais. 1940: On October 21, Karajan conducted a symphonic concert with the Staatskapelle at the Old Philharmonic. 1942: The Lindenoper had been bombed in 1941. The House reopened on December 12 with Wilhelm Furtwängler´s interpretation of Wagner´s Die Meistersinger von Nürnberg. 1944: When Joseph Goebbels proclaimed his “total war”, the Staatsoper was closed. The last performance before this event was Mozart´s Le nozze di Figaro, conducted by Johannes Schüler on August 31. The Staatskapelle continued to perform symphonic and opera concerts. On October 4 and 5, Karajan conducted Bruckner´s 8th symphony. 1945: The Lindenoper was once again destroyed on February 3. 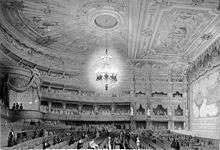 The concerts were relocated to the Admiralspalast and the Schauspielhaus. On February 18, Herbert von Karajan conducted his last symphonic concert with the Staatskapelle in the Beethoven hall. The second rebuilding took a long time. From 1945, the opera company played in the former Admiralspalast (today's Metropoltheater). From 1949, the company served as the state opera of East Germany. It moved back to its original home after the rebuilding in freely adapted baroque forms was finally completed in 1955. The newly rebuilt opera house was opened, again, with Wagner's Die Meistersinger von Nürnberg. The capacity is now about 1,300. After the Berlin Wall was built in 1961, the Opera was somewhat isolated, but still maintained a comprehensive repertoire that featured the classic and romantic period together with contemporary ballet and operas. After reunification, the Linden Opera rejoined the operatic world. Important works that had already performed in the past were rediscovered and discussed anew within the framework of a "Berlin Dramaturgy". Baroque Opera in particular was at the center of attention, with Cleopatra e Cesare, Croesus, L'Opera seria and Griselda. These works were performed by Belgian conductor René Jacobs together with the Akademie für Alte Musik Berlin and the Freiburger Barockorchester on period instruments. In the 1990s, the opera was officially renamed Staatsoper Unter den Linden. In 1992, the Argentine-Israeli conductor Daniel Barenboim was appointed Music Director. In 2000, the orchestra (according to its official website) elected Barenboim "conductor for life." During the 2002 Festtage, he led a Wagner cycle in ten parts, a production created in collaboration with director Harry Kupfer. Since 2009, the Berlin State Opera has been undergoing considerable renovation work led by German architect HG Merz. The roof of the opera building was raised and the proscenium prolonged to improve the acoustics. Other renovation and extension works include the director's building, the below-ground connection building and the depot building. The latter will house the new rehearsal center. "Immersion in centuries of music history". Staatsoper Unter den Linden. Retrieved 2007-04-23. Wikimedia Commons has media related to Berlin State Opera.